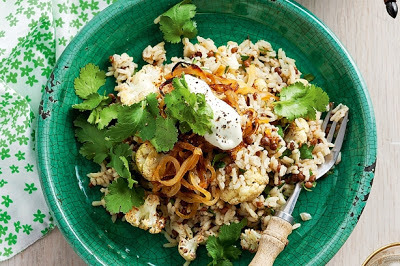 The Lebanese Recipes Kitchen (The home of delicious Lebanese Recipes and Middle Eastern food recipes) invites you to try Lebanese rice with lentils and toasted cauliflower recipe. Enjoy the Middle Eastern Cuisine and learn how to make Lebanese rice with lentils and toasted cauliflower. Preheat oven to 200°C/180°C fan-forced. Place cauliflower, sumac and 2 teaspoons oil in a roasting dish. Toss to coat. Season. Roast for 20 minutes or until golden and tender. Meanwhile, finely chop 1 onion. Heat 2 teaspoons of oil in a large saucepan over medium-high heat. Add onion. Cook, stirring, for 5 minutes or until softened. Add rice. Stir. Add stock and lentils. Season. Bring to the boil. Cover. Reduce heat to low. Simmer for 12 to 15 minutes or until rice is tender. Meanwhile, thinly slice remaining onions. Heat butter and remaining oil in a large frying pan over medium heat. Add onion. Cook, stirring, for 15 to 18 minutes or until golden and caramelised. Combine yoghurt and garlic in a small bowl. Season. Fluff rice with fork. Add cauliflower mixture and coriander. Gently toss to combine. Transfer to large serving plate. Top with caramelised onion and coriander leaves. Serve with garlic yoghurt.